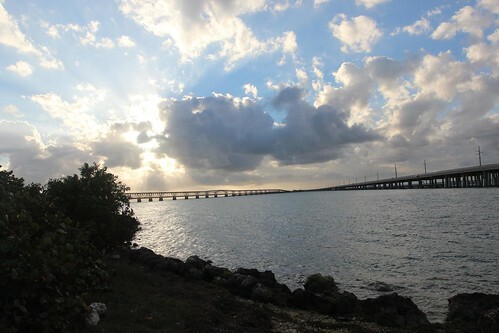 Mali Mish - Day 134: Our last day at Bahia Honda. Hold onto your seats everyone. Today we are going to see… nothing!! Yippee. Since our trip began over four months ago, almost every day has been go go go. It’s no one’s fault but our own. It’s hard to slow down when there are so many places to see. So today was our day to play catch up. Dan settled into his corner office and got down to business. 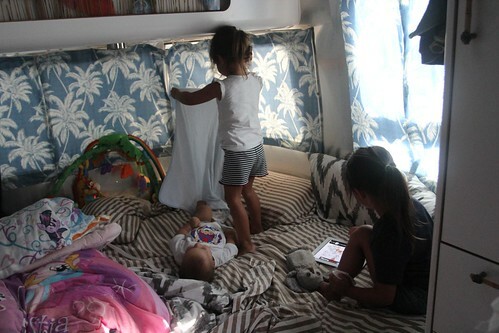 The kids took over our bedroom with toys, blankets, pillows and their favorite gadget, the iPad. I was planning on another beach day with the kids but they refused to leave the Airstream. If you look closely, you will see Ava holding a napkin on her leg. The mosquito bites are itching them like crazy, to the point that they are making themselves bleed. So they refused to go back outside today, for the fear that they will be eaten alive again. I don’t blame them. Poor Luka was getting messed with all day long. He is the girls’ favorite toy. Lucky for them, he is a good sport. Back in Louisville, Ava got a special delivery from one of our favorite Aistreamers, Weaselmouth. Tiffani was kind enough to think of Ava when she had an extra t-shirt from Alumafandango. She was excited to wear it. But for some reason, Luka LOVED the shirt even more. He kept reaching and grabbing for it all day long. 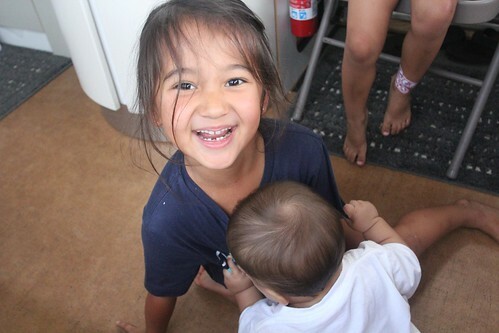 She loved the extra attention from him too. And when he nuzzled the shirt over and over again, the giggles would. not. stop. Ava has even asked to wear it again as soon as we clean it back up in the wash. Thanks again, Tiffani! 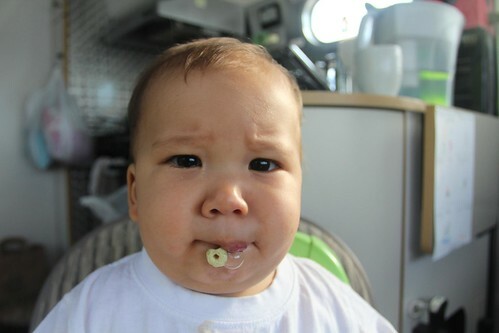 Today we also introduced some solids to Luka. 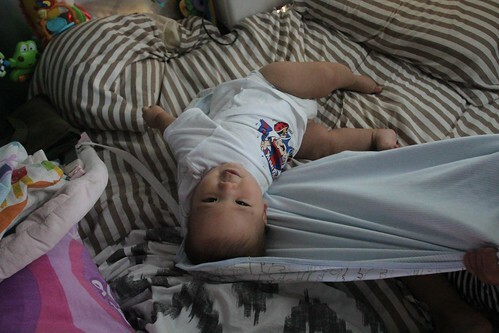 They are these cherrio-like things that dissolve quicker for babies called Puffs. It was hilarious to watch Luka figure out how to keep the Puff from not escaping his mouth. He obviously has some work to do. 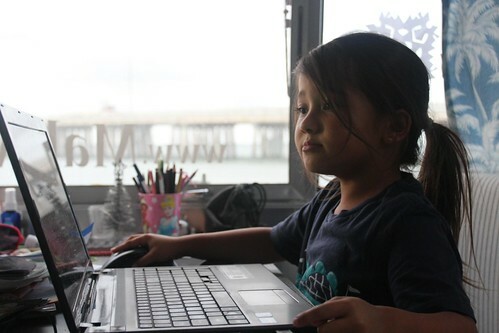 Every 20 days or so, Ava meets with her assigned teacher via Skype to discuss how Kindergarten on the road is going. Usually Ava is reserved during these online conversations but a few minutes into the session, she got the sillies and it was hard to keep her still. Homeschooling is going well with Ava. She has the short and long vowel thing figured out which makes book reading a lot smoother. She does tend to write a lot of letters backwards which will get sorted out eventually. Math is fun for her and she loves trying to tell us what the biggest number in the world is… until Dan busts he bubble when he says “plus one” to her. Doh! I lied about not going outside today. I did run outside for a picture of the sky around sunset… and then quickly ran back inside. It did it for the the blog, people! Damn, mosquitoes!! We ended the night with a few more Christmas decorations… and a reminder. 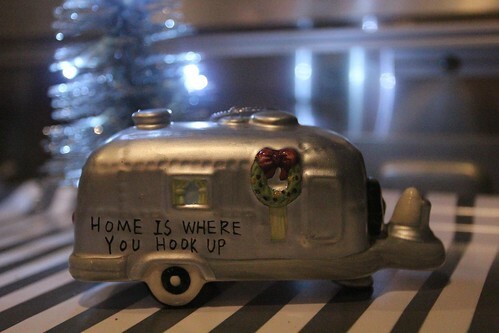 Home is where you hook up. Hehe. Day 135: Back to our favorite key, Long Key.